Can You Hear The Ticking? Has Jack Black found his genre? After the recent Goosebumps and Jumanji: Welcome To The Jungle, he’s back with another kid-esq escapade. Eli Roth, yes that Eli Roth of Death Wish and Hostel, directs from a screenplay by Eric Kripke (“Supernatural (TV)”, “Timeless (TV)”), and together they’ve created a child-friendly world full of magic and animated objects that falls somewhere between Harry Potter and Goosebumps. 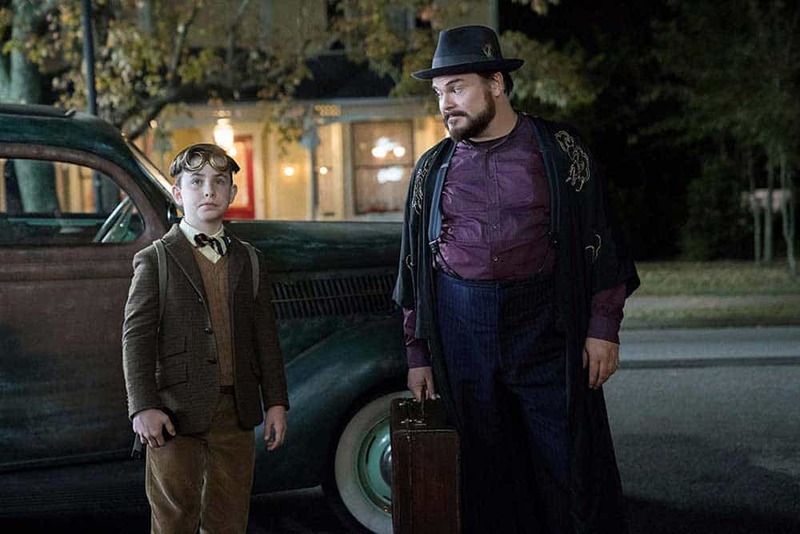 Owen Vaccaro (“Daddy’s Home”, “Fun Mom Dinner”) is Lewis, a young orphan boy who goes to live with his uncle Jonathan (Jack Black) in his big old, mysterious house. Living next door to Jonathan, though generally round his place all the time, is Florence Zimmerman, Cate Blanchett (“Thor: Ragnarok“, “Carol”), and together with strange goings on in the house, the pairing make an odd-couple. As it transpires, Jonathan is a warlock and Florence a witch, and they are hunting for the titular clock in the house. They know it does something bad, exactly what remains a mystery. As Lewis struggles to fit in at his new school, his attempt at impressing sees him raising the dead, never a good thing, and so begins a titanic race against time, magic, creepy dolls and pumpkins. You know where you are with Jack Black, he’s flamboyant in his methods, some may say over the top, but for a child-friendly production like this it works, it’s not breaking new ground, but it works. Blanchett is the prim and proper looking witch who isn’t afraid to trade verbal blows with Black whenever the opportunity arises, and it does so a lot, but she’s lost her mojo when it comes to magic. She adds a sense of balance to proceedings though at times you can practically hear her eyes rolling in her head. But films like this rely heavily on the young person at the centre of it all which in this case is Owen Vaccaro. He has a child-like charm to his personality, a face full of wonder and questioning, he is however, a little too screamy at times, not the calmest boy. Klye MacLachlan (“Twin Peaks (TV)”, “Inside Out”) is the evil warlock who has put the clock in the walls, but we don’t get to see much of him and when we do, well, let’s say he’s not looking his best. Roth walks the line between dark and child-friendly well, in my opinion at least, though I’m not a kid, nor do I have any. I can imagine the automatons could be a little scary, perhaps the pumpkins too, but the film is a 12A and I’d have thought they’d be fine with it all. Generally, he keeps things moving and at a reasonable pace. It doesn’t quite have the magical moments of Harry Potter, nor the charm and continuous comedy of a Charlie And The Chocolate Factory, say. That’s not to say it isn’t funny, there are some laugh out loud moments and there’s plenty of gunk flying around to keep some kids happy (though do 12-year olds still laugh at gunk? ), but some gags fall flat the moment they arrive on screen but are persisted with throughout for some reason. The House With A Clock In Its Walls is a nice, fun, family-friendly movie that, whilst not breaking new ground, is a welcome addition to the genre and gives Eli Roth something he can finally show his kids. If movies were like dance music though, I’d be looking forward to the remix much more!